After the reconstruction of an old house and turning the garden upside down, only a single flower species bravely survived: a snowdrop. 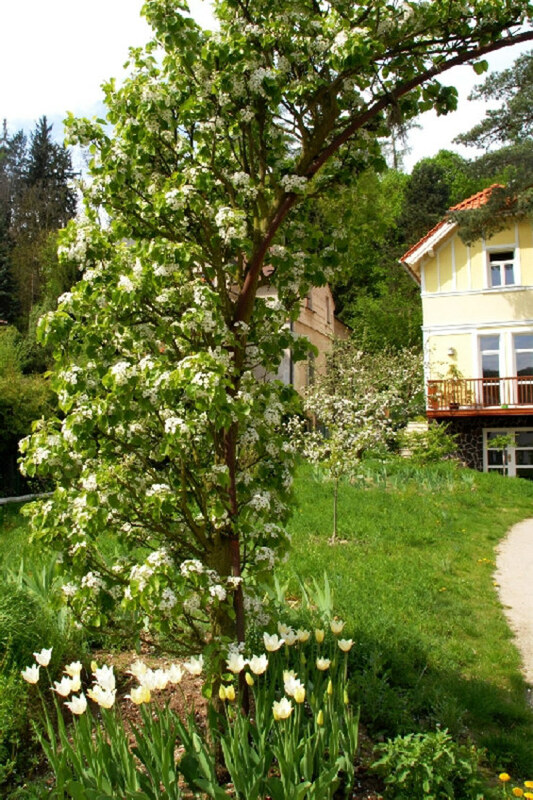 The garden is located at the edge of a municipal forest in a suburb of Prague. There are 800 square metres of old orchard and an overly dense growth of exotic conifers around a villa built around 1930. 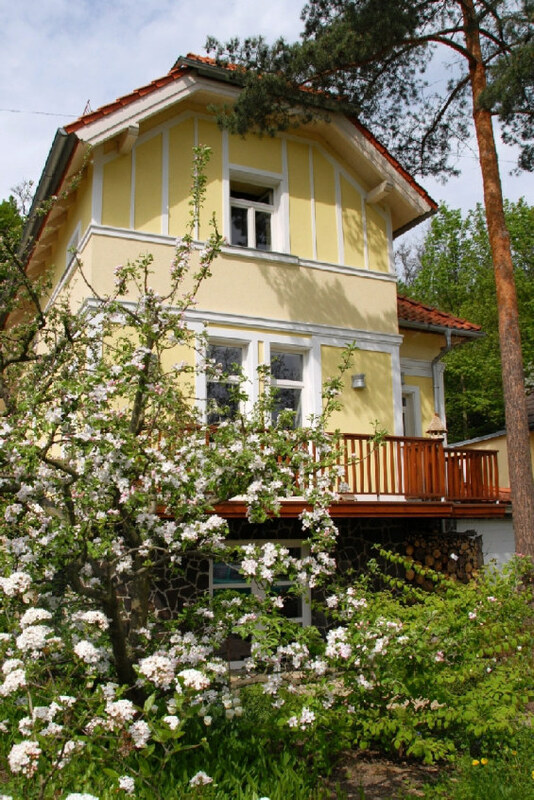 The romantic house was very lovingly restored, and the idea for the future garden was similar: to save all healthier trees and bring back the charming atmosphere of the era between the World Wars. The first step was clearing the back part on the slope under the forest. Most of the work had to be done by hand or using only light machines – there is no access for heavier machinery. There are also many roots belonging to a large pine tree, a Turkish hazel, a walnut tree and several twisted old fruit trees. 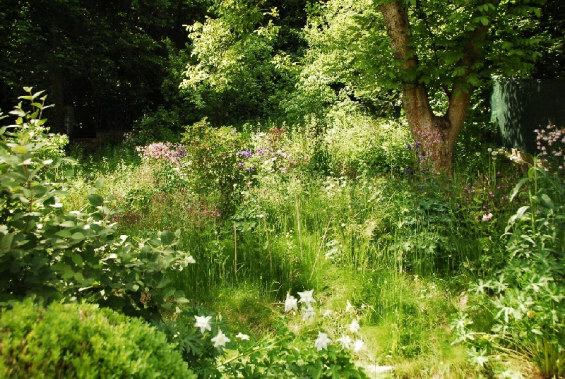 The idea of light shaded meadow with scattered trees and shrubs, which has been here for years and years was realized. Just a dry wall built of local stone, typical for the era of thirties, looks rather new, but it will weather over time. There is a path made of stepping stones laid in a very natural way that winds through the slope leading to the small gate to the forest. Another step was to clean an old, too dense orchard. 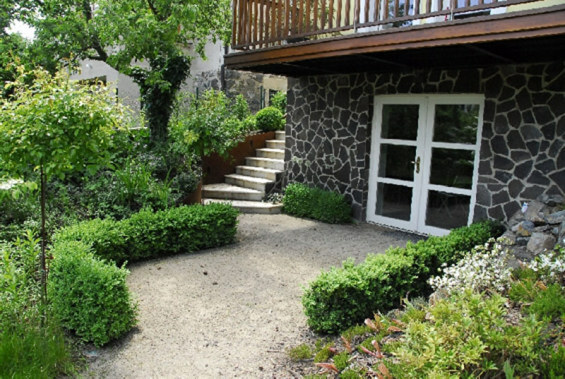 A large walnut tree next to the gate, beautiful pine in front of the house, and several fruit trees were saved and protected during the construction. The area was changed into a sunny meadow with elliptic islands of irises, hydrangeas and other shrubs. A small patio in front of the basement fireplace room is lined by a formal low hedge made of Buxus, but the rest of the planting is lush, nostalgic and very free growing. Box is used also on a small terrace at the main door of the house: the ball shaped shrubs are playfully mixed with perennials and joined by azaleas and rhododendrons. 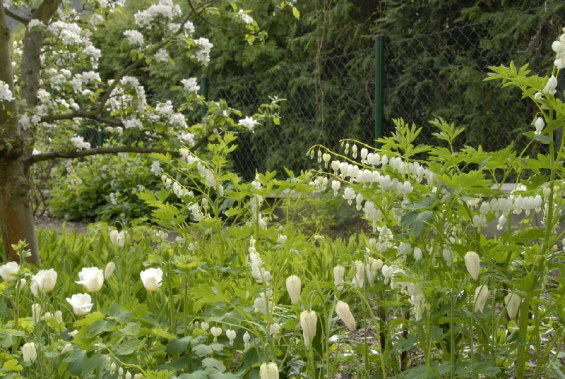 The garden is monochromatic – white – or green/white. 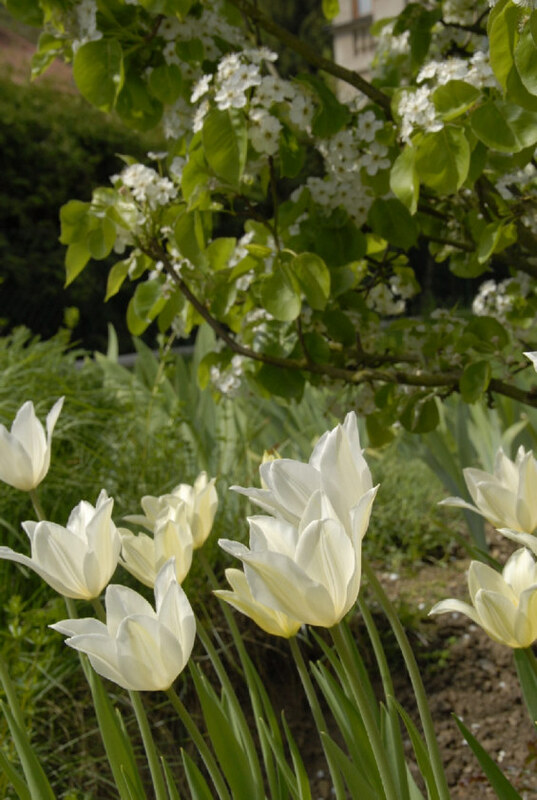 There are fruit trees, and arch of ornamental pear (Pyrus calleryana ´Chanticleer´), white and white green hydrangeas, white roses, heatheres, viburnums, perennials (Iris, Dicentra, Phlox, Pulmonaria, Viola…) and bulbs (Tulipa, Narcisssus, Scilla). 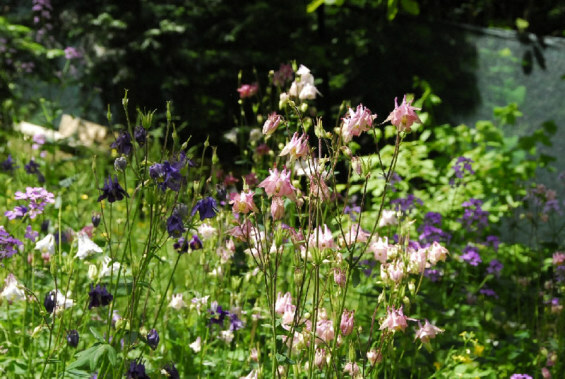 Some of the white garden hybrids reverted over the years into their original species in mixture of blues, mauves and pinks (Aquilegia vulgaris ´Kristal´, Digitalis purpurea ´Camelot White´ etc). White Rosa ´Innocentia´ turns light pink in very cold weather – as we simply play with the garden, it plays with us in turn. “I have previously worked for the clients some years before with the same contractor on another project. We became friends over the course of time so the cooperation was very pleasant and fruitful. 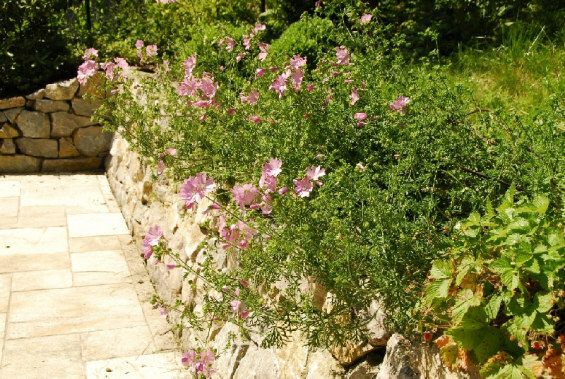 It was quite hard to say, who brought forth an idea – once the client, once me, once the gardeners… Our idea was to create sustainable, low maintenance garden – and to protect the soul of the site, bring back the beauty and atmosphere of old times. The garden is nostalgic, but there are some intriguing design details. 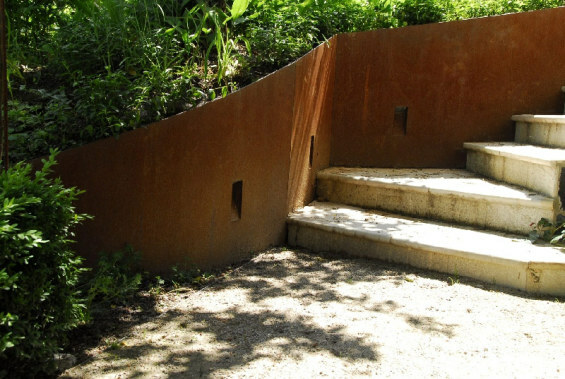 Because of old trees, which would be considered by many people as worthless and cut down, we decided to use cor-ten instead of much thicker stone walls at the stairs and garage. 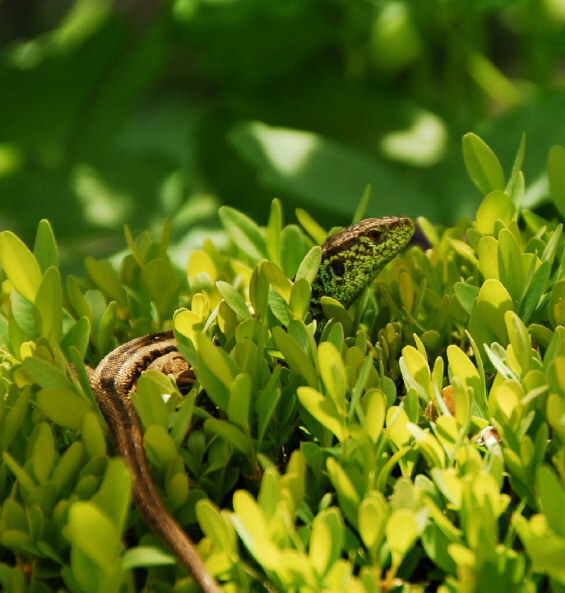 It is a surprising but fresh feature in the “old” garden. We also choose a cor-ten garden light and bronze pots as matching accessories. We made meadows instead of mowed lawns, which saves water and energy and avoids kilos of chemicals to be spread into the environment. Pesticides are used only very rarely, just in few cases and in small amounts. We use compost as a fertilizer and leaves as a mulch. There is a heap of logs for hedgehogs, and the stone wall is a home and shelter for lizards. They also love box topiary and come to sunbathe on the balls. The meadow full of flowers and flowering shrubs are valuable for insects and birds find their food and shelter in the meadow as well.